Breaking Views: GWPF Newsletter: What Is Behind The Latest Climate Doomsday Scare? GWPF Newsletter: What Is Behind The Latest Climate Doomsday Scare? 3) What Is Behind The Latest Climate Doomsday Scare? Radical scientists call for global collectivism, including behavioral changes, new governance arrangements, and transformed social values. No new science, no new scenario and consequently no new cause for panic. It’s been a long heatwave in much of Europe which has prompted questions like ‘what is the influence of climate change on this year’s heatwave?’ Some claim that it’s twice as likely to occur, while others claim that climate change is making it worse. “This is the face of climate change,” says Professor Michael Mann. There is a feeling in the hot air that this summer is showing the way of the future. Expect this kind of thing more often is the cry. Whatever way the evidence points, wherever the argument goes or the temperature changes in the future, the media have loved the “Earth’s on Fire,” headlines. But if you thought that was bad wait for the apocalypse. A new paper claims were are heading to a “Hothouse Earth,” and perhaps soon. Cue the heatwave fever on steroids. The first thing to bear with the paper that suggest this is that it is a “Perspective” paper in the Proceedings of the National Academy of Science of the USA. Yet, it is not a research paper and contains nothing new in the way of climate science. It is a future scenario pieced together by quoting selected (cherry-picked) references with a lot of hand-waving in-between. The author’s say it’s not conclusive, and they hope it’s not going to be true. They have a responsibility to ask the question, they claim, admitting its extreme. The report starts as it continues. It says the formalisation of the Anthropocene – the controversial ‘geological’ epoch in which mankind allegedly dominates natural processes – is being considered by the stratigraphic community. Just a few days after this paper was accepted for publication, the International Commission on Stratigraphy decided against endorsing the Anthropocene, saying that we live in the Meghalayan Epoch instead. However the author’s then go on to say that it is actually irrelevant what the geological community decides, they are going to claim the Anthropocene exists anyway. Human activity, they conclude, now rivals geological forces. This whole scenario moves into what many would regard as extreme scientific speculation. There is no real evidence in the scientific literature that a rise of global temperatures by two degree C above pre-industrial temperatures will be a tipping point. The most recent report by the IPCC rejected such doomsday scenarios as highly unlikely. There is no new science that this is a threshold after which global warming will become unstoppable. No new science, no new scenario and consequently no new cause for panic. But that’s not the message in the media. There is nothing wrong with presenting an extreme scenario in order to highlight possibilities and to stimulate research. But as far as presenting it to the public, and as far as reporting it by the news media, it is essential to put it into the context of scientific facts and research. The vast majority of climate scientists are not predicting a hothouse Earth. 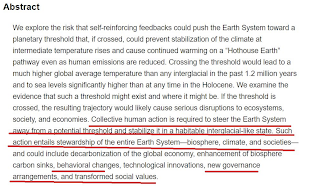 This provocative paper contradicts the scientific state of climate research. If it is a warning then it should not be presented as a prediction. It does not warrant all the lurid headlines. Hans Joachim Schellnhuber’s dream of a world government and geocybernetic control. Professor Hans Joachim Schellnhuber is one of the top players within the faction of climate research viewing man as responsible for climate changes. He currently leads the Potsdam Institute in Berlin and has served as an advisor to the EU Commission President Jose Manuel Barroso and German Chancellor Angela Merkel. Schellnhuber has been given wide powers and is involved in numerous contexts. In addition to his advisory role to the political elite, he has been part of the World Economic Forum Global Agenda Council on Climate Change, the European Climate Foundation and editor of several scientific journals. Along with David Wasdell and others from the British Meridian Programme, he developed the ideas of ”Tipping Points” in the climate (Apollo Gaia Project), which predicted that small temperature increases could lead to disastrous consequences, for example by the tundra thawing and releasing large amounts of methane gas. 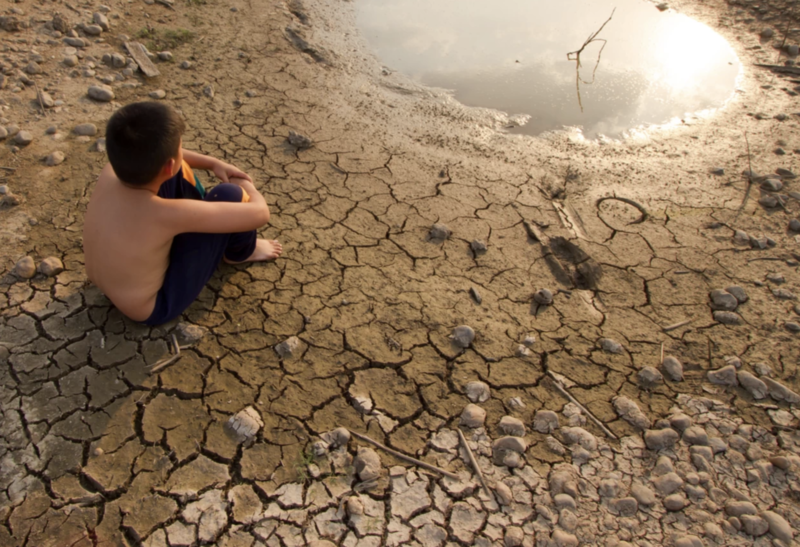 Since then he has been involved in the World Bank report, Turn Down the Heat – Why a 4°C Warmer World Must be Avoided, which discussed the consequences of a mean global warming of 4 degrees Celsius. Schellnhuber, however, was not only an advocate for the Tipping Points theory, but he also proposes large-scale solutions to the climate problem. This is, as the opening quotation illustrates, of ideas of a World Government and the associated global governance of environment and development. This is also illustrated by other statements by Schellnhuber. In order to curb the “climate crisis” he wants to establish a Constitution for the planet based on the UN Charter, a Global Council, and a Planetary Court. He sees this as a sophisticated version of the idea of a World Government. He also suggests that a number of national parliamentarians should be replaced by Global Ombudsmen. These should speak for future generations and stand as a counterweight to national interests. This has been criticized for being undemocratic practices. For, who chooses the ombudsmen? Implementing these plans requires, according to Schellnhuber, that nations give up large parts of their sovereignty. He refers to borders now being irrelevant to the global economic players. It is this global elite which Schellnhuber ultimately works for, despite his talk of a democratic society which protects the interests of the majority rather than of the rich minority. In actual fact, this rich minority have been highly involved in the whole process from the beginning. This is done by funding radical movements which then demand the very change the elite wants to achieve. Schellnhuber himself has been involved in the European Climate Foundation, created by Big Business, which funds numerous environmental organisations (and even creates new ones) in order to implement the Foundation’s long-term goals. Today, the concepts have been developed even further. The Potsdam Institute is currently working closely with other institutions in a network by the name Planetary Boundaries Research Network. Here Johan Rockström and Stockholm Resilience Centre play important roles. Through Rockström nine planetary boundaries which may not to be transgressed were identified in 2008. It was claimed that if they were, global disasters may ensue such as drought, sea level rises and pandemics. Schellnhuber was one of the signatories to the article where the results were presented and then published in Nature. It all also touches on the concept which David Wasdell at Meridian Programme developed before the G8 summit in Glenaegles 2005. The problems could not be solved with the current system but required stronger global institutions. 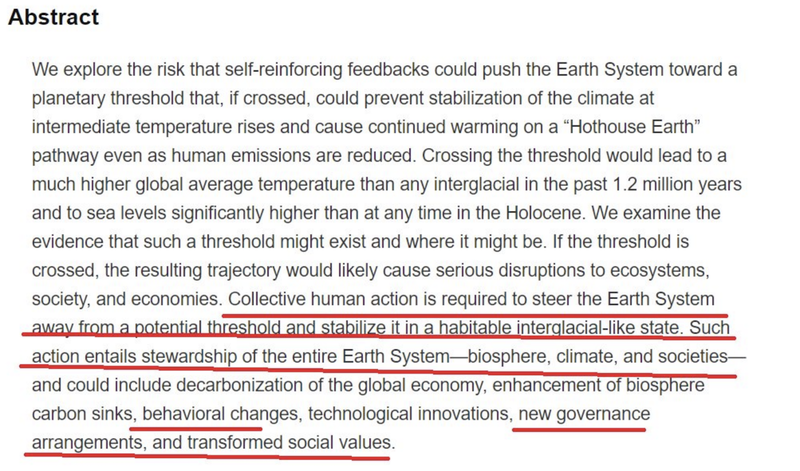 Getting support for this eventually required more alarming warnings than what the IPCC could deliver. This is also something which Anders Wijkman and the Club of Rome have long since embraced and towards which the World Bank report came as if to order. The decarbonization of the global economy is, according to these experts, comparable with the Neolithic Revolution and the Industrial Revolution. These were, however, unplanned, natural historical processes. The “Great Transformation” however, must be consciously planned and controlled. It would be a historical novelty. This strong state provides, therefore, for the “social problematization” of unsustainable lifestyles. It overcomes “stakeholders” and “veto players” who “impede the transition to a sustainable society.” In Germany, climate protection should therefore become a fundamental goal of the state for which the legal actions of the legislative, executive and judicial branches will be aligned. “In order to anchor future interests institutionally, the Council recommends expanding the parliamentary legislative process with a deliberative ”future chamber”. To avoid interference by interest group and political parties, the composition of this chamber could be determined, for example, by drawing lots. Earth's surface will almost certainly not warm up four or five degrees Celsius by 2100, according to a study released Wednesday which, if correct, voids worst-case UN climate change predictions. A revised calculation of how greenhouse gases drive up the planet's temperature reduces the range of possible end-of-century outcomes by more than half, researchers said in the report, published in the journal Nature. "Our study all but rules out very low and very high climate sensitivities," said lead author Peter Cox, a professor at the University of Exeter. How effectively the world slashes CO2 and methane emissions, improves energy efficiency, and develops technologies to remove CO2 from the air will determine whether climate change remains manageable or unleashes a maelstrom of human misery. But uncertainty about how hot things will get also stems from the inability of scientists to nail down a very simple question: By how much will Earth's average surface temperature go up if the amount of CO2 in the atmosphere is doubled? That "known unknown" is called equilibrium climate sensitivity (ECS), and for the last 25 years the UN's Intergovernmental Panel on Climate Change (IPCC)—the ultimate authority on climate science—has settled on a range of 1.5 C to 4.5 C (2.7 to 8.1 degrees Fahrenheit). Cox and colleagues, using a new methodology, have come up with a far narrower range: 2.2 C to 3.4 C, with a best estimate of 2.8 C (5 F). If accurate, it precludes the most destructive doomsday scenarios. Climate trouble in the Social Democratic Party (SPD): Environment Minister Schulze wanted stricter CO2 limits for cars. First the car industry rebelled and than the workers’ councils – then Germany’s Vice-Chancellor pulled the plug on the plan. When it comes to climate protection, the impact of car traffic looks devastating: since 1990, the emission of greenhouse gases by German cars has even increased slightly. Ever larger and faster cars, especially SUVs, eat up all the fuel savings that engineers get out of modern engines. By signing Paris climate agreement, Germany has committed to achieving stringent climate protection goals by 2030. An opportunity to do so would be to set new CO2 limits for cars at EU level. But the federal government is just about to miss this opportunity. The reason: differences between Finance ministers Olaf Scholz (SPD) and Environment Minister Svenja Schulze (SPD) over increased climate targets for cars. 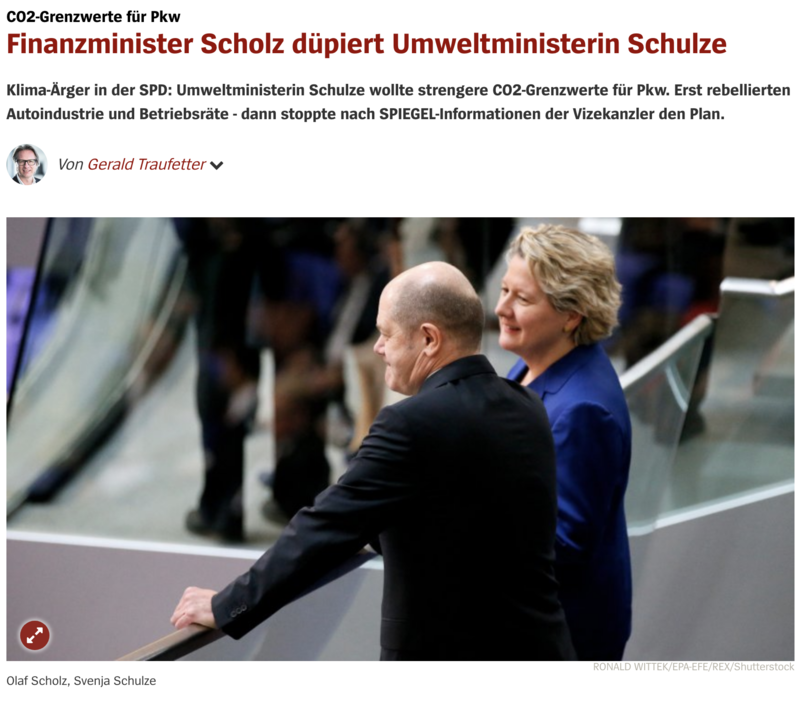 According to SPIEGEL, Scholz, at a meeting with Schulze in the Ministry of Finance, complained about her proposal to reduce the CO2 emissions for the passenger cars by 50 percent by 2030 compared to 2021. The environment minister had demanded this for new targets at EU level. This goal should now be off the table. The only issue now is looking for a way for the environment minister to come out of the conflict without losing face. An important role in this decision was played by the visit of the workers’ councils of German car companies in Berlin in mid-July. Among other things, they explained to Schulze that a 50% reduction in cars’ CO2 emissions was allegedly technically impossible and would lead to high job losses. Criticism comes from climate activists: “The car companies and their suppliers are trying to artificially extend the life of the traditional combustion engine in Europe,” said Christian Hochfeld, director of the think tank Agora Verkehrswende. In October, the Federal Government will have to comment on a proposal on new CO2 limits at the EU Council of Environment Ministers. At the beginning of next year, the new EU regulation should then be adopted. Germany enjoys a reputation as a pioneer of clean energy. Its leader Angela Merkel was even dubbed the "climate chancellor" when she decided to ditch nuclear power in 2011. But the reality is much dirtier. Centuries-old villages across the country are being bulldozed to make way to mine brown coal — one of the filthiest and cheapest fossil fuels. As the world's biggest brown coal miner, Germany is at risk of missing its 2020 carbon emissions targets. The latest rural idyll threatened with destruction is the medieval village of Pödelwitz, in the eastern state of Saxony. Its quaint timber-framed houses stand empty and only 27 out of 200 villagers remain because mining company MIBRAG wants to dig up the coal that lies beneath.…. Rebecca Bertram, senior policy adviser with the Heinrich Böll Foundation — a think tank affiliated with Germany's Green Party — agrees that weaning the country off brown coal is no easy task. She says that while the lignite sector employs a mere 20,000 people, it provides jobs in regions with little other industrial work, and so the miners are going to fight for their jobs. "The problem with coal is that it's so localized and that they're very well organized in terms of unions," Bertram says. "Unlike in the United States, our trade unions are very strong and always have to be a part of the discussions." Fewer tornadoes are touching down in the United States, and we can thank global warming. This is the good news from researchers at the University of Illinois, who suggest that changes in atmospheric circulation linked to Arctic sea-ice retreat is the likely cause. The reduced activity, the researchers believe, can be explained by how diminishing Arctic sea ice controls the path of the jet stream. As Arctic sea ice retreats, the jet stream migrates northward, and the atmospheric conditions that are favourable for tornado formation follow suit. The researchers have analysed nearly three decades of weather and climate data, and found particularly strong correlations between tornado activity and the extent of Arctic sea ice, particularly during the month July. Al Gore has directly linked tornadoes in previous years to climate change. Now it is clear that the trend has been for fewer tornadoes in the United States. In 2013, the tragic Oklahoma Tornado was followed by claims by Scientific American that climate change may be to blame. The new findings should help quell the habitual hysteria surrounding the link between climate change and extreme weather events, and remind us that the consequences of a changing climate are not necessarily bad. 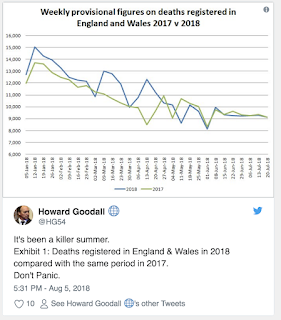 A healthcare expert at the Office for National Statistics has warned that provisional death figures published by the authority do not support claims of a “killer heatwave” as covered in the UK national press. Dailies the Daily Express, the Mirror, and the Sun have referenced the ONS statistics in articles which claim a “killer” heatwave has caused a spike in the number of deaths in June and July in the UK. 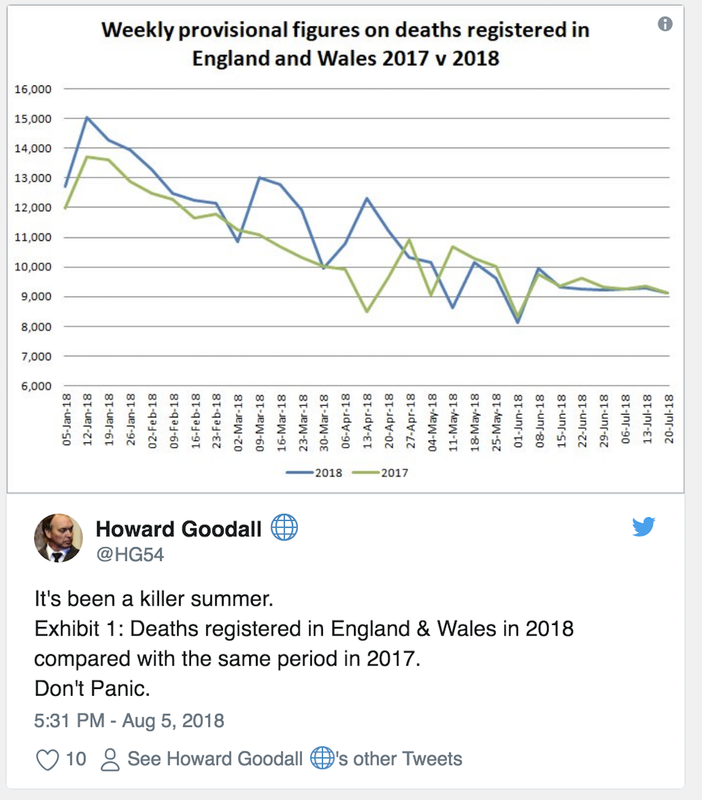 The number of registered deaths in England And Wales between 2 June and 20 July – the latest period for which figures are available – totals 73,586. This is 995 higher than the five-year-average for the seven-week period, but claims that the heat is to blame is not supported by the data according to Nick Stripe, deputy director of health analysis at the ONS. It’s clear that high temperatures have had precisely no effect on mortality so far, which of course is something to be celebrated, although it’s not particularly surprising. 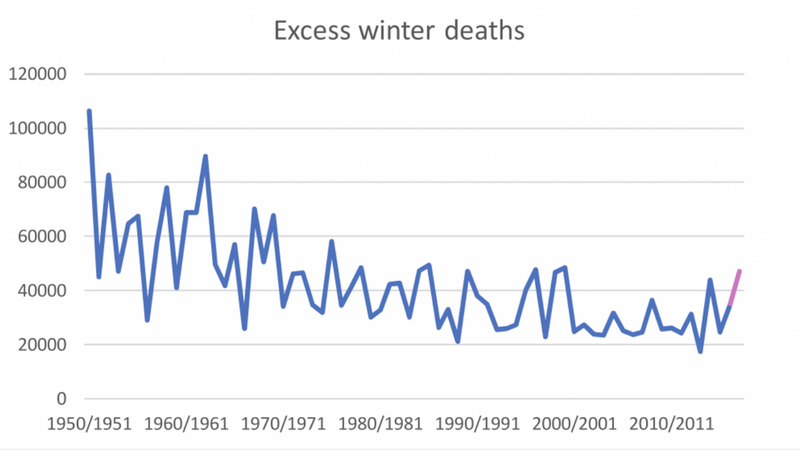 However, the left-hand end of the graph suggests that the winter deaths figure is not doing so well, with almost every week this year characterised by mortality figures that are higher than the previous year. A little further investigation suggests that the deaths figure for winter 2017/18 will be as much as 13,000 above the figure for the previous year. 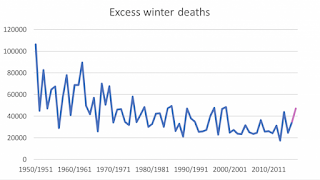 It is clear that the long decline in excess winter deaths came to end in the first years of this century and that there has been an upward tend in recent years. In half a century, the average number of annual fatalities declined more than 80%. In his posthumously published book “Factfulness,” the Swedish statistician Hans Rosling describes a paradox: “The image of a dangerous world has never been broadcast more effectively than it is now, while the world has never been less violent and more safe.” A case in point: natural disasters. The earth will always be volatile, but despite recent fires, volcanoes and hurricanes, humanity currently is experiencing a stretch of good fortune when it comes to disasters. It’s difficult to be “factful” about disasters—the vivid trauma of each event distracts observers from the long-term decrease in destructiveness. But climate activists make the problem worse by blaming every extreme weather event on human-caused climate change, hoping to scare people into elevated concern. Disasters certainly continue to cause catastrophic damage across the globe. The annual cost of disasters has doubled since reliable accounting of all events world-wide began in 1990, rising from about $100 billion to $200 billion a year in 2017 dollars. But it’s deceptive to track disasters primarily in terms of aggregate cost. Since 1990, the global population has increased by more than 2.2 billion, and the global economy has more than doubled in size. This means more lives and wealth are at risk with each successive disaster. Despite this increased exposure, disasters are claiming fewer lives. Data tracked by Our World in Data shows that from 2007-17, an average of 7,000 people each year were killed by natural disasters. In the decade 50 years earlier, the annual figure was more than 37,000. Seven thousand is still far too many, but the reduction represents enormous progress. The material cost of disasters also has decreased when considered as a proportion of the global economy. Since 1990, economic losses from disasters have decreased by about 20% as a proportion of world-wide gross domestic product. The trend still holds when the measurement is narrowed to weather-related disasters, which decreased similarly as a share of global GDP even as the dollar cost of disasters increased. The decrease in disaster damage isn’t a surprise, because as the world population and economy have grown, the incidence of the most damaging extreme events has hardly changed. The Intergovernmental Panel on Climate Change reported in 2014 that there has been no increase in hurricanes, floods, droughts or tornadoes within the past 30 years. And 2018 is on track to have the lowest losses from disasters as a share of global GDP since 1990. In place of today’s unproductive scare campaign, activists and the media should facilitate debate on the merits of actual climate-policy proposals, such as a carbon tax or improved flood defenses. Carbon dioxide emissions have indeed contributed to a global temperature increase and may yet influence extreme weather, so the public and policy makers must decide the best ways to reduce emissions and increase society’s resilience to extreme weather. Lindsay Mitchell: Not naming fathers a "rort"
Peter Van Doren: Is Green Energy Competitive?